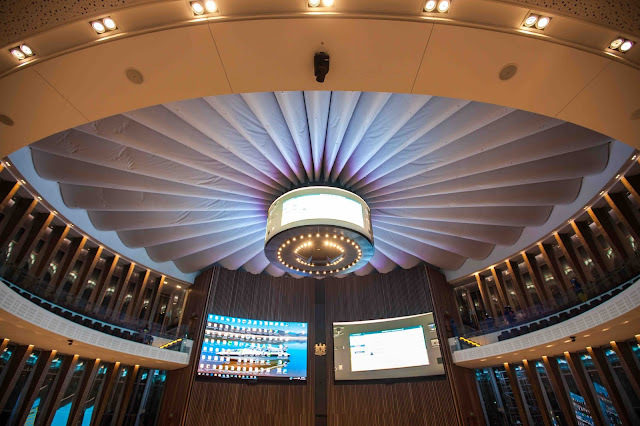 Joburg Property Company (JPC), managers of the City of Johannesburg (CoJ) property portfolio, have been instrumental in the conceptual design of the Council Chamber which was inspired by the SeTswana word “Lekgotla”, an outdoor meeting space which is circular in form. The JPC was honoured when it was shortlisted in the Public Services Development category for the International Property Awards (IPA) because of the very nature of the building and its purpose. The JPC was delighted and particularly proud when the award was presented to the JPC as the winner in this category where there were 14 entries in total for Africa and Arabia. This award was presented at the prestigious IPA ceremony held on 7 September 2017 at the JW Marriott Marquis Hotel in Dubai. Being a part of the IPA Public Services Development category has shown that the Council Chamber,a world class architectural innovation which is not an anomaly in South Africa but in a globally competitive property development environment, stands as one of the best in its class. This award has given JPC the opportunity to showcase the Chamber and its surrounding Piazza. The vision was to consolidate the municipality’s office space, which was dispersed through the city and rented from third parties, into one specific location owned by the municipality. Through this process, the Council Chamber and the surrounding planned Metro Centre will act as a catalyst for future mixed-use development – thus promoting investment, economic growth and job creation in the city centre. The vision was therefore for the Metro Centre to become the epi-centre of efficient operations and services for the City of Johannesburg. In addition, the precinct would become a civic landmark, a beacon that evokes civic pride and identity. The relationship of the Metro Centre to its immediate urban context is therefore pivotal to encouraging this civic identity. The inside of the Chamber has been designed in such a way that it provides seating capacity for 361 councillors and 158 seats in the gallery for the public and media – 80 seats more than is currently required, in order to cater for future expansion. The state-of-the-art audio-visual and delegate system is fully programmable and completely customised to be updated in line with any future changes in the way that the Chamber operates. 500 Jobs were created from the surrounding communities. The architect therefore wanted to celebrate African principles of space- making, while incorporating smart technologies and green building systems. The open air Piazza alongside the Chamber encourages the local community to come together and enjoy the various aspects that have been built for their leisure and enjoyment such as the outdoor gym, children’s playground and chess set. The art that was selected for the inside of the building, has in its simplicity and design, been selected to ensure that a story is told from past and present using not only art forms but also different forms of material from copper to steel, from canvas to glass. As the years go by, the story will still be told in the way that it should be, that of the journey of Johannesburg and its residents to that of freedom within the city. One of the unique features of the building was the Council Chamber Totem Art Competition 2016 (open to both young and old, professionals and hopefuls) invited artists to submit drawings, paintings and prints that told a unique story about their community and their community’s history. The winning designs have been translated into wooden totems placed inside the Council Chamber building. To stand a chance of being selected, citizens were encouraged to base their designs on the overarching theme of warmth and inclusivity at the new Chamber. More importantly, their totems needed to embody and represent the distinctive stories of the inhabitants of their respective communities. From over 500 entries, 134 winners were selected. The youngest entrants were of a pre-primary school age; and the oldest were mature adults. As permanent fixtures woven into the fabric of the Council Chamber’s design, these totems will stand as testaments to the people of Johannesburg and their heritage. The building stands tall and proud and those that work and live in Johannesburg are reminded every day of the emerging skyline that is changing within the Johannesburg CBD and that we will once again have a city that is world class and visited by millions of tourists every year.